BBC. Nature documentary. Sir David Attenborough. We don’t really need to say anything more to show this DVD and Blu-ray is worth a look … but we will, of course. Frozen Planet has excellent pedigree. It’s a BBC/Discovery Channel co-production by Alastair Fothergill, executive producer of the awesome Planet Earth and The Blue Planet: Seas of Life. In Frozen Planet, Fothergill tackles two disappearing wildernesses: the Arctic and the Antarctic. Featuring shots of the icy landscape and the wildlife that makes the areas home, the documentary was filmed using the same camera techniques as Planet Earth and Life, getting footage above and below the ice. 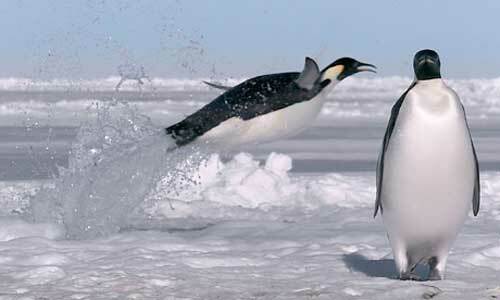 Among those shown in the series are the wandering albatross, the adelie penguin and the polar bear. And their stories are told by the awesome David Attenborough. Frozen Planet airs on Discovery in the U.S. starting March 18, 2012. In support of the DVD and Blu-ray, BBC has partnered with natural history travel company Tauck for a Polar Bear Adventure Sweepstakes. One pair of winners in the U.S. and one pair in Canada will get the chance to observe the endangered animals up close in Manitoba, Canada, in a six-day trip. As well as roundtrip airfare, the winners have local sightseeing, two full-day excursions into polar bear country, a private cocktail party, dinner at the Manitoba Museum, a storytelling session with a First Nation resident, a dog sledding demonstration and more.